Built in 1920s by Arab immigrants, abandoned during WWII, opened as a restaurant in the 80s, closed down in the 2003, this building has almost a hundred years of history. The older generation still remember this as a date place and a hotspot for weddings. 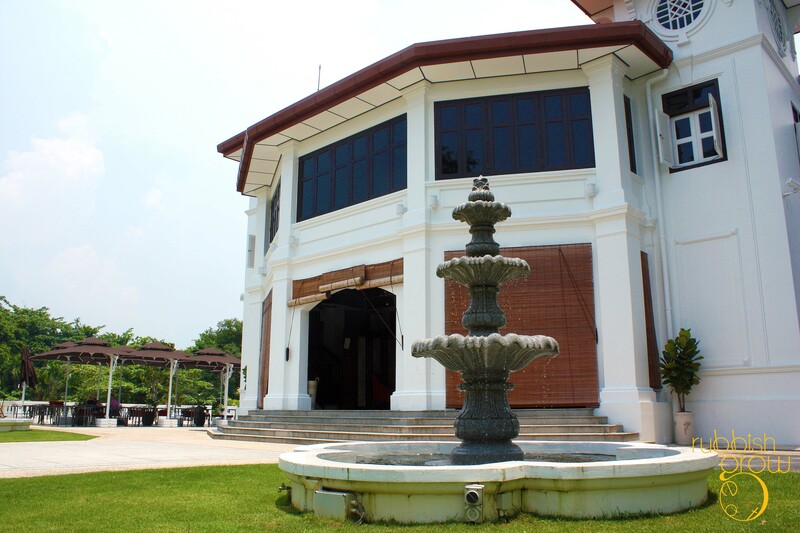 The Mansion is opened recently by LHN Group, which won the bid from Singapore Land Authority at a monthly rent of near $80, 000 and renovated the mansion at $5 million. Wow. This is serious business. Don’t play play. Best way to access the mansion is to drive or take a cab. But if you want to walk off the calories first before the meal–settle the guilt before, instead of after, the meal–it’s an upslope walk of ten minutes from the bus-stop. 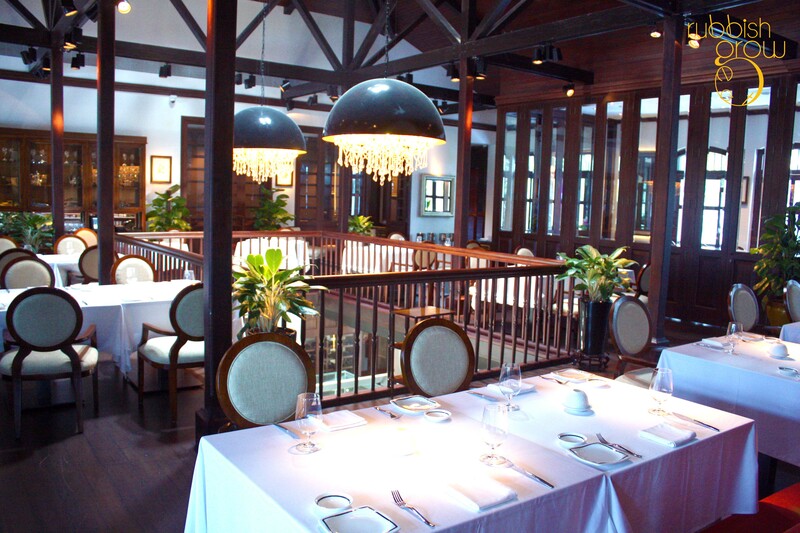 Decor: Within the building, the restaurant consist two storeys. Much of the original design is retained. An epergne of lovely lavender(?) greets you at the door. The retro floor tiles and chairs fit into the overall architecture of the building. In the middle of the dining hall, there is a modern, glass-walled temperature-controlled room to store cold cuts and cheese, which are sliced to order. You can tell how careful the decor is: every table is spotlighted with a fixed lamp from the ceiling, so you have to know the exact position of the tables and dimensions in relation to the space. 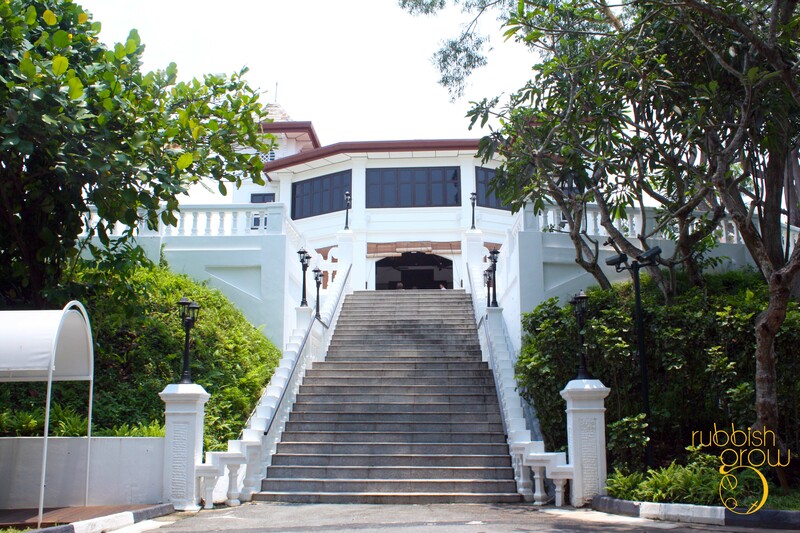 A timber staircase to the second floor will lead you to a colonial-designed bar. On the second floor, there are also private rooms and there is no additional cost to them at the moment! Book now! The decor as a whole is stylish and luxurious to impress a romantic date but it is not stifling. 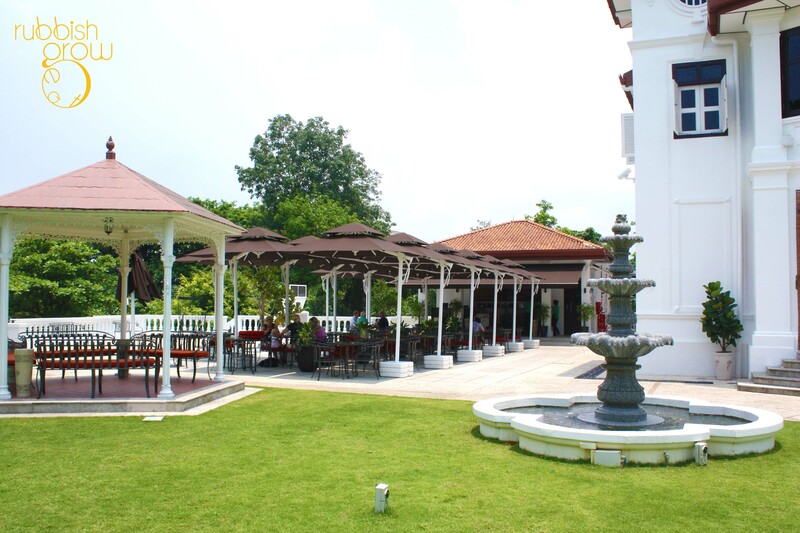 The al fresco cafe (mentioned earlier) serves more casual and wallet-friendly food while the restaurant has a more high-end feel (see restaurant’s menu here). Gabriele Piegala, who used to be executive chef of Senso Ristorante, helms the kitchen. The complimentary bread, freshly baked in the kitchen, comes in two types: the rye dark bread with seeds that Europeans like and the soft white fluffy ones with tomato and cheese on top (like a pizza) that Singaporeans prefer. 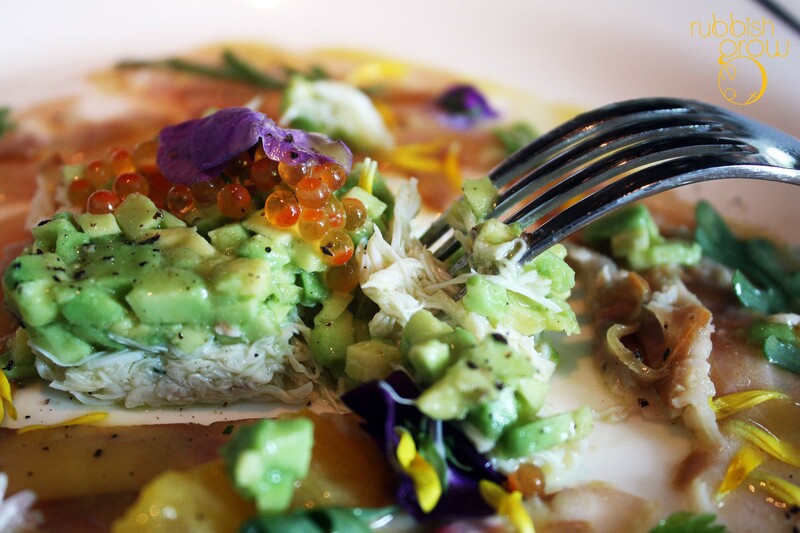 Smoked Sturgeon with avocado and crab served with citrus fruit emulsion ($30). Full marks for visual presentation. 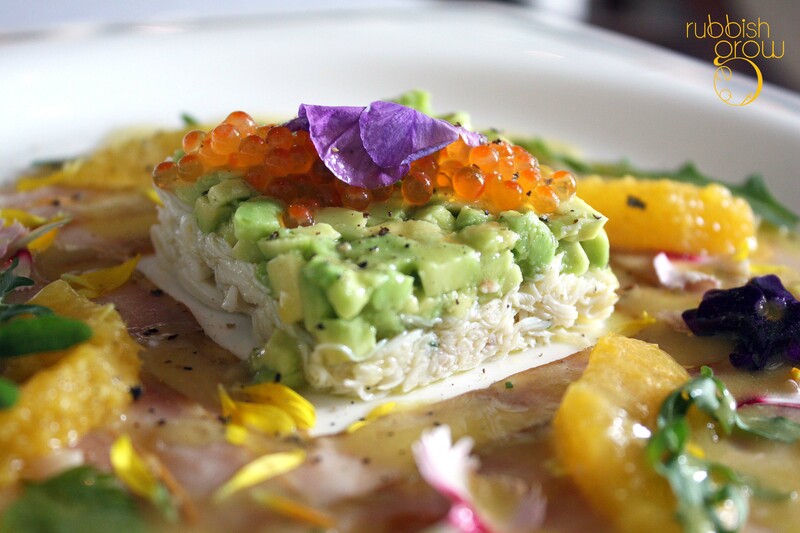 An island of green creamy avocado and white crab meat, topped with a sprawl of lucent orange roe and a violet flower petal, is surrounded by a sea of fish and mandarin orange and a scattering of yellow petals and rocket. Gorgeous. The flavors and textures work wonderfully together: the creamy soft avocado, crisp-popping fish-oil roe; floral scent of petals; ocean-sweetness of crab; bitterness and crunchiness of arugula, and not-stringent pleasantness of the citrus. The smoked sturgeon’s fishiness is masked by these flavors and tastes similar to tuna tartare. It is often easy to ruin a dish by having so many ingredients but this dish is well thought out and the flavors work well. An accomplished dish. Pan Fried Mozzarella with Parma ham and marinated artichoke ($24). This is a delightful and layered dish! The pan-seared hot parma ham warps around the cold mozzarella cheese so the first taste is a salty-but-pleasant ham followed by the milkiness-but-not-salty cheese. It has a chewy, bouncy, almost fishball-like texture that is very fun. The artichoke comes across as a tone-down salted vegetable (kian cai). 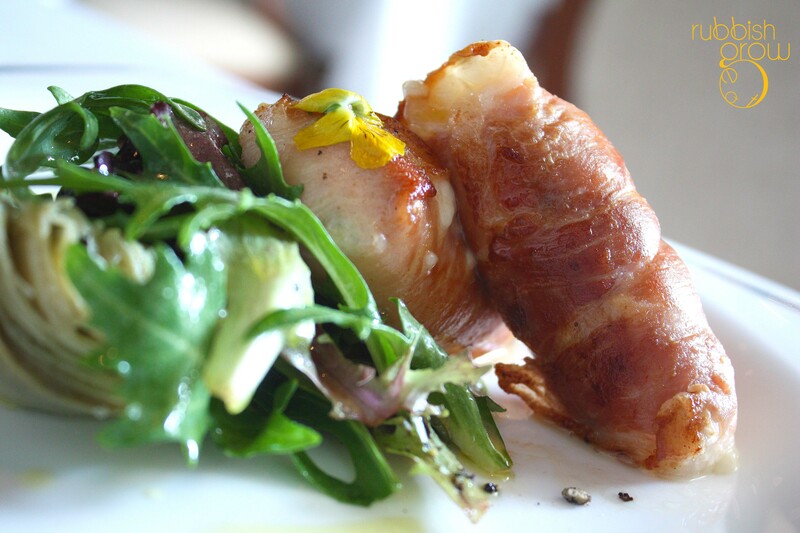 If it is a tad salty or oily, the taste is balanced by the bitter, crunchy rocket. This is a well-rounded dish! Crispy duck Foie Gras with caramelized onion, beer and cherry relish ($28). Chef Piegala explained that polenta flour around the foie gras is to give it a crispiness and to absorb the oil of the duck liver. In theory, the dish seems to work but in practice, I’ve some doubts. While the foie gras is crispy, it lacks the melt-in-your-mouth buttery texture. 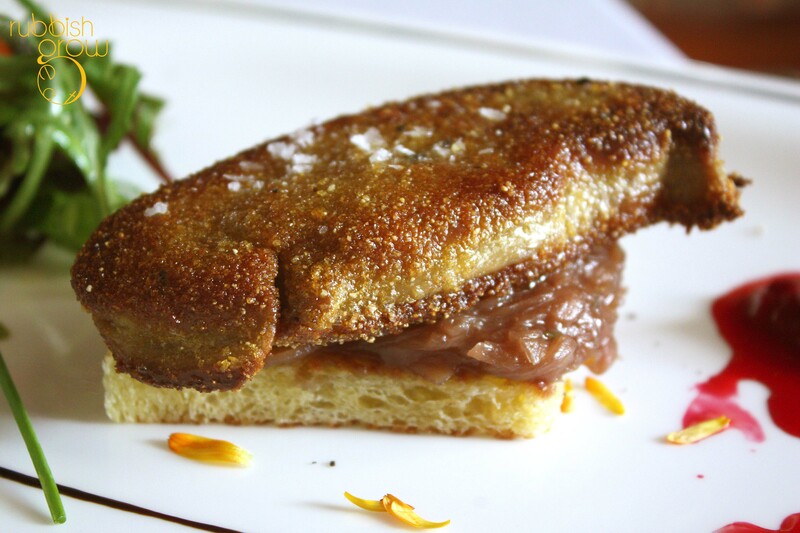 Eaten as a whole–foie gras, caramelized onion and brioche–the brioche softens the taste of the foie gras so it may come across as bland even though the foie gras is infused with something that tastes like curry. (Does foie gras work with curry?) However, if you add the beer-cherry compote to foie gras, the compote enhances the buttery nature of foie gras, bringing the essence out. The size is a winner. It is very difficult to assess this dish. If you assess it based on conventional criteria of what a foie gras should be, then it isn’t that. But if you assess it based on creativity of a completely new dish, wholly independent of tradition (which I believe is what the chef is trying to achieve), then it is not bad. 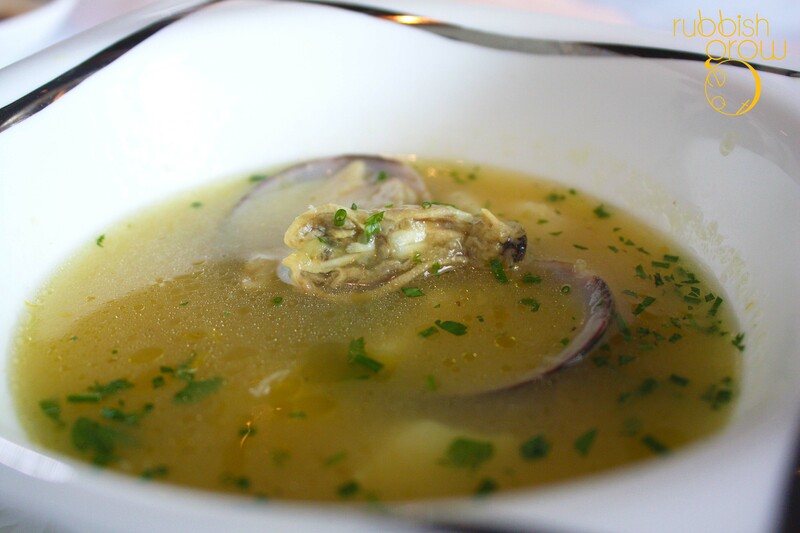 Fish and Seafood Soup in saffron and fennel seed broth Sardinian Lifeguard style ($18). If you want to know what saffron tastes like, this is the dish to order. With a thin film of oil, it is buttery and at some sips, there is a sudden and refreshing burst of lemon. I counted, among the seafood, fish, clam, mussel, scallop (very fresh and bouncy), and crab (sweet!). At first, both Melicacy and I didn’t like the taste but as we took in more mouthfuls, the taste grows on you. While this is catered to a more European sensibility, if you give it a chance, you will definitely like it. We did and in the end, we licked the bowls. It is an excellent multi-dimensional soup. 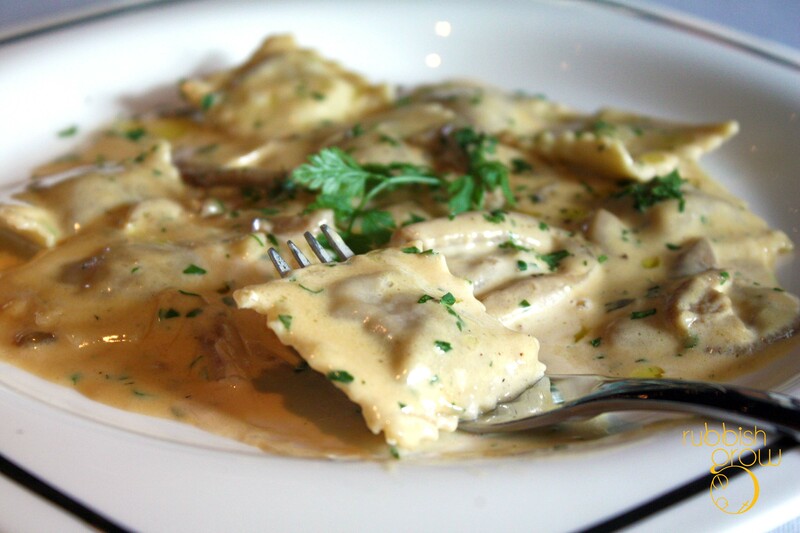 Veal Ravioli with porcini mushroom cream sauce scented with white truffle ($26). The scent of white truffle strikes you and your stomach growls despite having three appetizers! The truffle enhances the fragrance of the herbs. Ravioli–or Italian wanton!–is done al dente so it retains a chewiness. The shredded veal within is very tender. However, it is a pity that the veal is too thin because it gets subsumed by and takes on the texture of ravioli and the taste of the wonderful, wonderful cheesy mushroom sauce. We licked up the sauce. 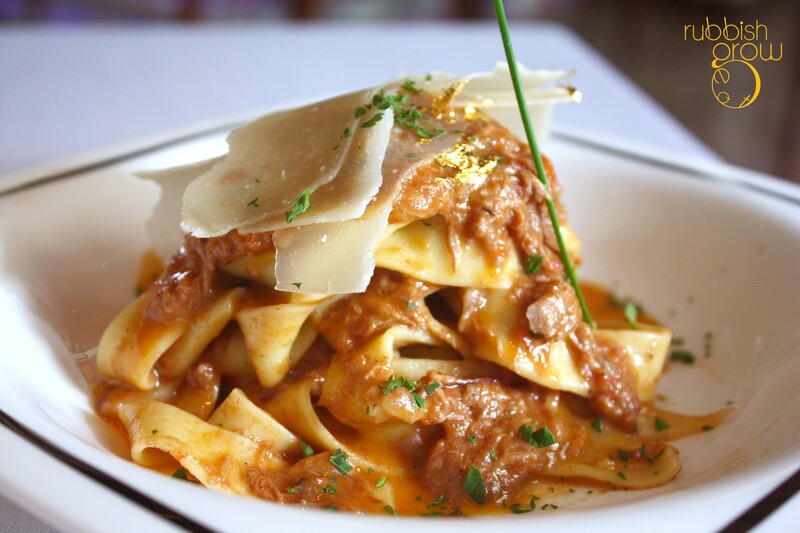 Pappardelle with wild boar ragout ($26). Another full marks for presentation! A mountain of pasta topped with sheets of parmesan cheese and gold flakes! GOLD FLAKES! WOW. The wild boar is marinated for 7 days in red wine sauce because wild boar tends to be gamey and tough. This shredded boar still retains its character with a pleasing smokiness. The al dente ribbon pasta is coated entirely in the very awesome salty sauce. It is salty but in a savory way. 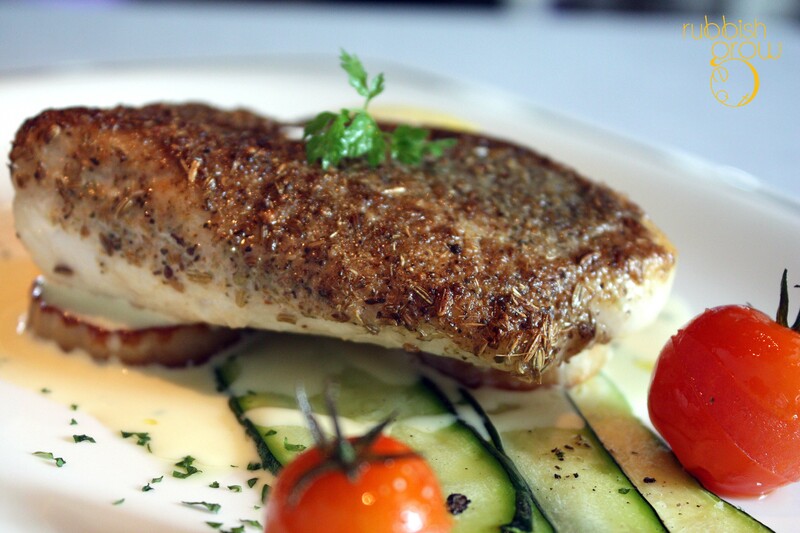 Oven baked Red Snapper served with potato, zucchini and black olives ($34).The hot cherry tomato bursts in the mouth! While the potato is standard, we enjoyed the zucchini, which tastes more like avocado than cucumber. The fish itself is firm with a crispy top of herbs (including a hint of curry powder and anise?) and without being dry. The sauce is appetizing, sourish, vinegary, which Melicacy guessed is emulsified butter. I prefer firm fish, not flakey one, so this works for me. If you like a more tender fish, then perhaps this one won’t suit you. 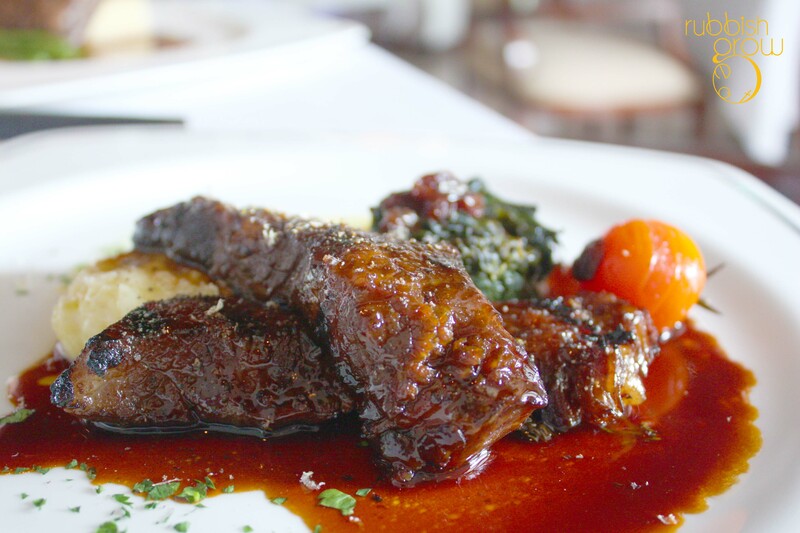 Short Ribs with mashed potato and spinach with raisin is a Restaurant Week feature and isn’t on the menu yet. It should be on the menu permanently!! The mashed potato is very smooth and super deliciously cheesy and the spinach-and-raisin is a nicely paired. But the show-stopper is the fantastic short ribs. It has an amazing texture, crispy, slightly charred with the smokey BBQ fragrance, with a very tender inside. It is cooked for two days in apple juice and soya sauce at 60 degrees. The sauce is made from port wine, which is sweet and tasting almost char-siew like. Superb dish! 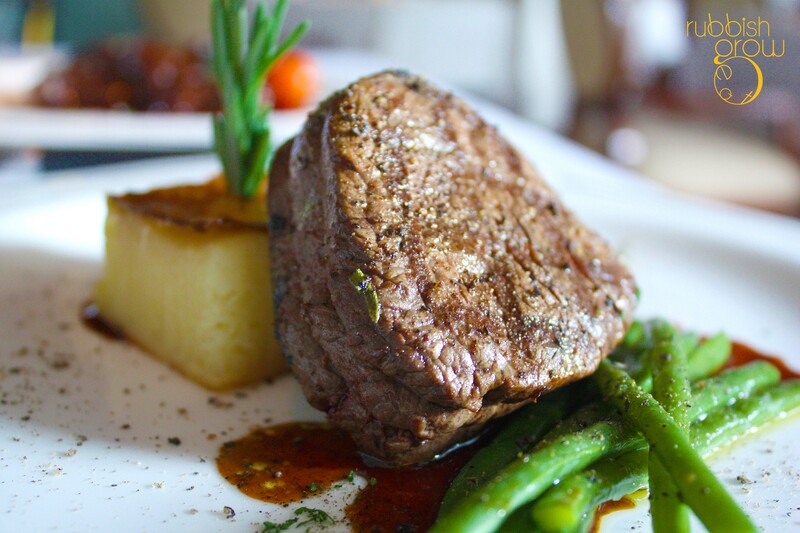 Grilled beef tenderloin served with Kenya beans in black truffle sauce ($38). On one hand, we know how much the rent is but on the other hand, I won’t bear to pay $38 for this dish. The pan-seared mashed potato is disappointing and dry. While the beef is done according to what we ordered (medium-rare), it is just that. The fascinating and fantastic part comes in the black truffle sauce, very savory, very flavorful, but I don’t know if the dish could hold up with just a sauce. My problem with the desserts is they are all good! I don’t know which one to recommend. Lavender Creme Brulee with poached pear, garnished with Anice Tuile ($12). 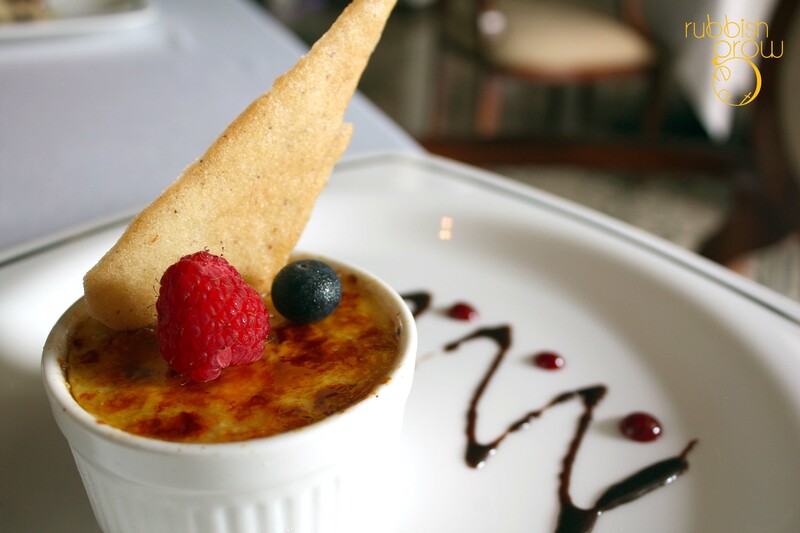 The lavender comes as a sweet fragrance–you won’t get to taste it–and the creme brulee is nicely caramelized on the top. The poached pear within provides a nice textural contrast to the smooth custard. Eggless custard Panna Cotta with fresh raspberry compote ($12). I can’t believe it is eggless because it is rich. 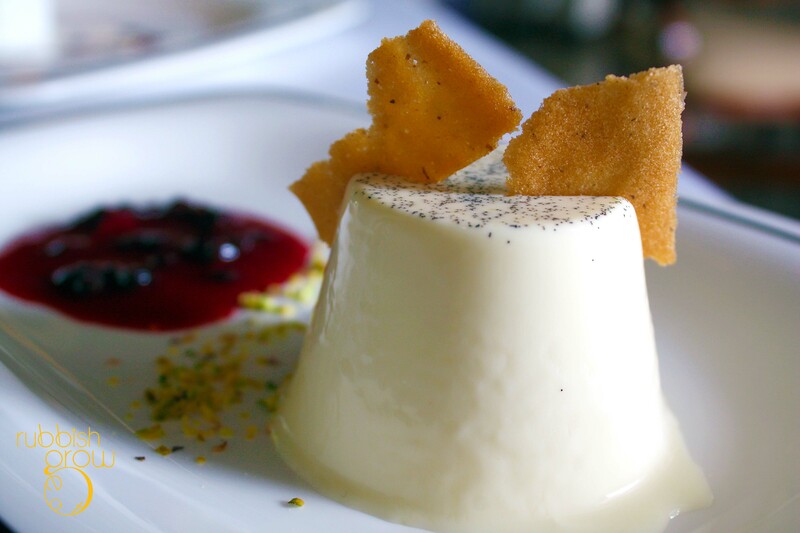 Is there a slight hint of anise in the panna cotta, providing a more layered taste? It is smooth but without being brittle. The raspberry compote brings out the vanilla flavor of the panno cotta. 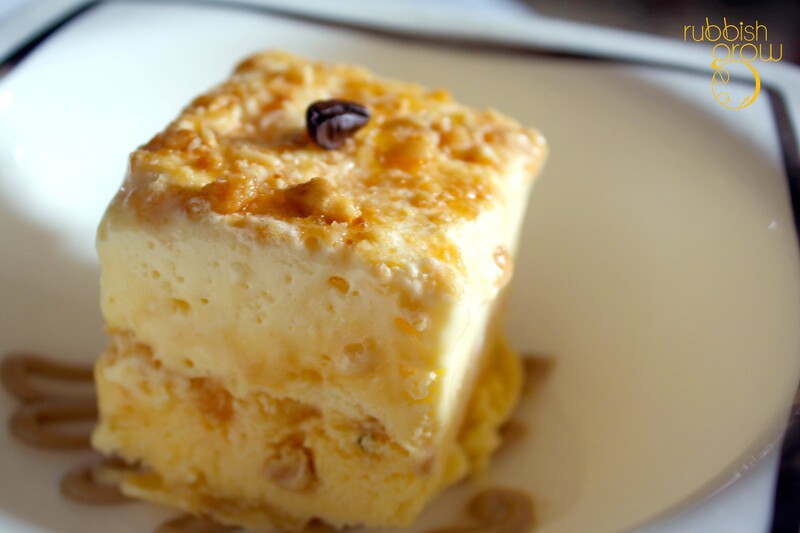 Home made caramelized almond Semifreddo with coffee sauce ($14). “Semi” means “half” and “freddo” means “cold” so you’d know this is a two layered dessert with frozen cream and ice cream. This is kickass sweet! It tastes like butterscotch ice cream with nuts. The coffee sauce doesn’t come on strongly. The ice cream at the bottom has the ice-shard texture that we didn’t like but taste-wise, this is our favorite. Alkaff Signature Tiramisu ($14) and what a signature it is! 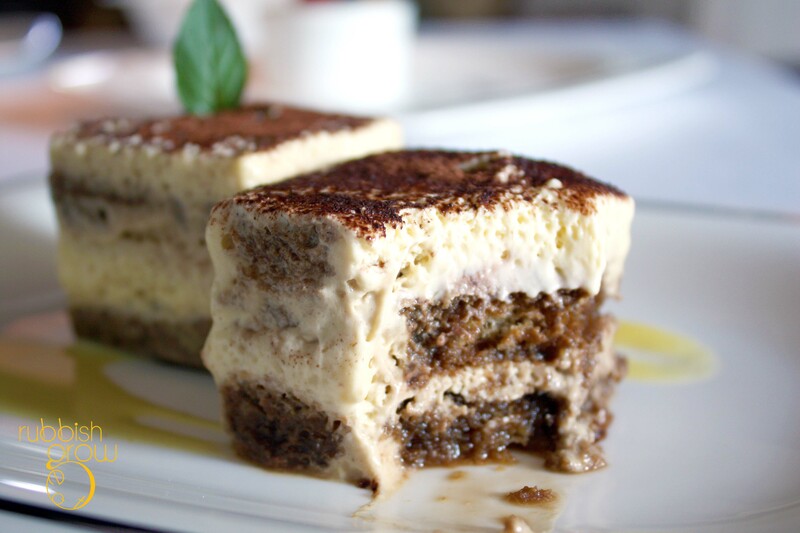 This is one of the best tiramisu I have tasted! It is so soft and creamy and moist. 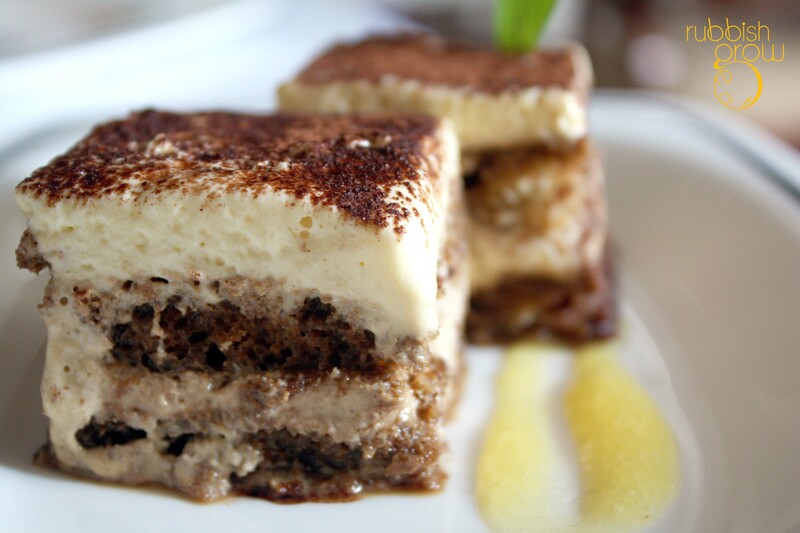 I don’t like coffee in general, but this tiramisu has such a great balance in taste that I didn’t mind the caffeine. Outstanding. Service: Full marks. Knowledgable service staff, polite, thoughtful without being sycophantic. Glasses of water are always filled. The service staff noticed that Melicacy wanted a saucer of olive oil and a separate saucer of balsamic vinaigrette for dip of bread and they served her that constantly. Verdict: Everything is well conceptualized. The food took some time to come but the tardiness proves its freshness. The food always came hot and the restaurant does savory salty dishes–pastas and appetizers–very admirably. Not a fan of savory salty dishes in general, even I am won over. From an objective point of view, we can see how all the dishes are accomplished, carefully prepared and have a certain standard. The restaurant is so good I think I’ll return in near future to check out the cafe! Watch this space. PS: We thank Shi Hui, Gabriele, Ashok for the invite and the wonderful hospitality. It’s totally a date place. 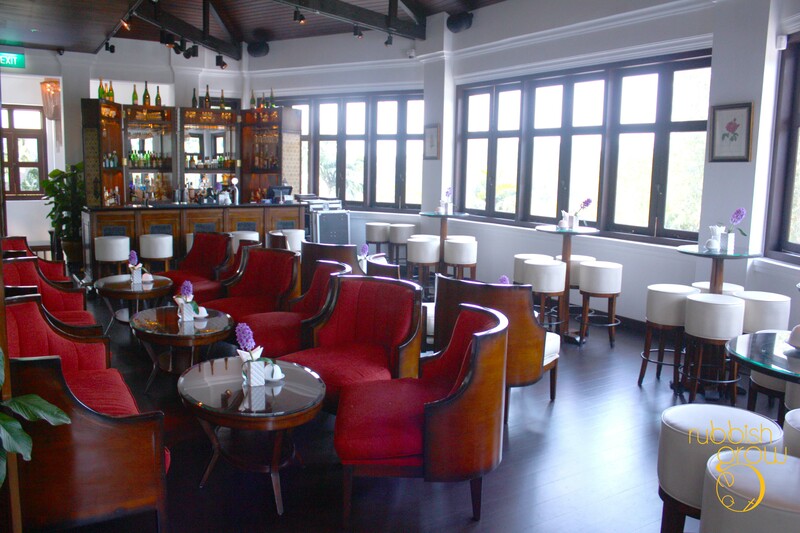 But the al fresco cafe by the side is cheaper and ideal for group of friends and afterwork hangout. I stumbled upon your site as we are soon to dine at Alkalaff Mansion. I applaud the idea of a community blog such as this but feel the reviewer is a wannabe food critic with little or no experience of what to expect from European fine dining. It is hard to decode what is most annoying about the review, possibly it is: “Everything is well conceptualized. The food took some time to come but the tardiness proves its freshness”. W$&@! You are not at a hawker centre! 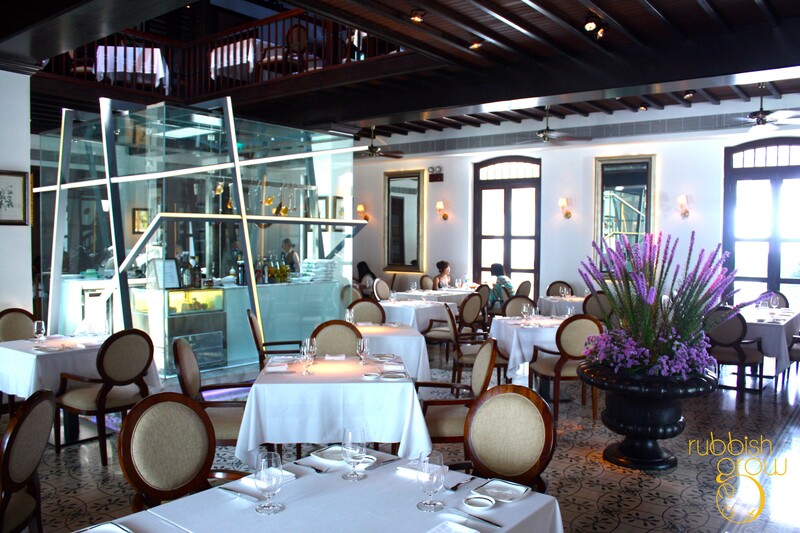 The goal is not to fill your belly in a hurry but to savor fine food in ambient settings at a relaxed pace. Thanks for your comment. We will try to improve. I feel a blog is a place for anyone to say what they wish, especially if it is their own. So I think it’s nice of writers to share their own opinions on their OWN blogs. :) No right or wrong. Anyway, nice photos! I checked the map and was wondering… what’s the best way to walk up to the mansion? Can one cut through the blocks of flats from Depot Road? Thanks! Sorry, you can’t walk through the flats. The place is pretty inaccessible. Best by car or taxi. 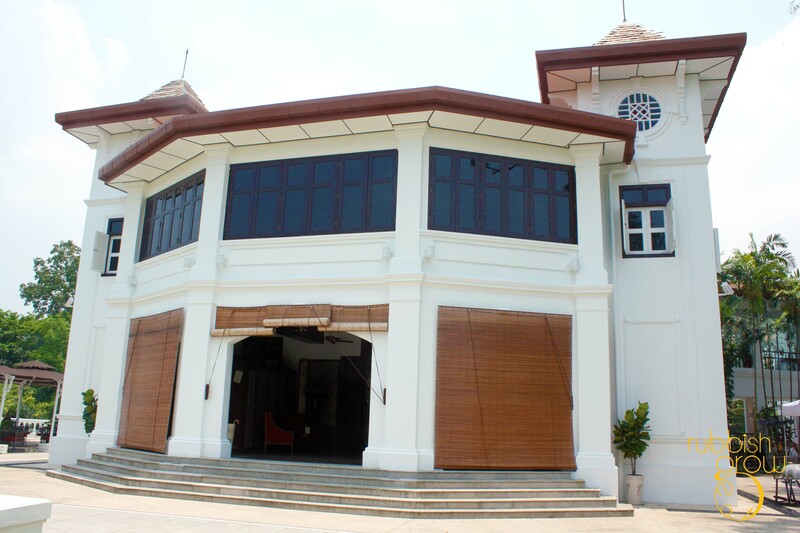 I ate at the Allkaff mansion many years ago befor it was closed and all I can say it was one of the highlights of my visit to wonderful Singapore so the new one cannot be any different and I look forward to visiting Singapore again and visiting the new mansion.